I absolutely love celebrating all of the holidays and when I spotted this idea on Kerry's blog Oh So Amelia last year I knew I would want to make one for Zach. I think that making baskets like these is such a lovely idea, and I had so much fun finding all the bits to put inside it. I can't wait to make them as he grows older, as well as ones for the other holidays throughout the year. I realise that this year he won't really appreciate it, but I wanted to make one for his first Halloween to start a tradition. 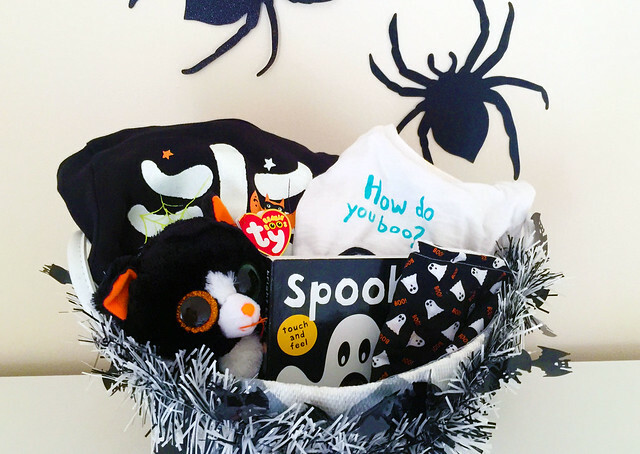 You might recognise a lot of the things in his basket from the Halloween Wishlist I posted a few weeks ago. I couldn't wait to dress Zach up, and when I spotted this skeleton sleepsuit from Tesco I knew it would be perfect. We have now got outfits for all three of us, and we will be a family of skeletons! Jono's Nanny bought him this gorgeous top from Zara which I think is so adorable. It will be perfect for him to wear during the day while we do Halloween activities. I found a dribble bib with little ghosts and the word boo! all over it on eBay which is the perfect accessory. Zach really loves books at the moment, but I will only let him read board books as he rips (and eats!) any paper he comes in contact with. I can't wait to read this Spooky book with him tomorrow. To finish the basket I added this black cat beanie baby. When I was younger I had a huge collection of beanie babies, and although the design of the toys has changed, that ty tag makes me so nostalgic! Are you celebrating Halloween? Do you have any holiday traditions with your children?